One Owner Boat Since New All New Bridge and Aft Deck Enclosures in 2018 Bow and Stern Thrusters Economical and Dependable Cummins 380 QSB Diesels Premium Navigation Package Includes Color Radar/ GPS/ Chart Plotter with Depth Finder and Autopilot Sirius Satellite Capable Bridge Stereo with Aft Deck Remote Bridge Refrigerator Two Stateroom and Two Head Layout Huge Master Stateroom with Island Style Walk Around Bed with Inner Spring Mattress Private Forward VIP Stateroom with Inner Spring Mattress Fold Out Flex-Steel Bed-Sleeps 6 Adults Washer and Dryer Combo Simply stated this is the best value of a 408 Meridian or any aft cabin motor yacht on the market. The owners of One Mo Time are ready to change their boating lifestyle and have priced this boat to be the next aft cabin motor yacht sold. Don't let the low price fool you. She is very clean and maintained. Her bottom was painted in October of 2018. She has all new bridge and aft deck enclosures from 2018. This is a boat you can buy today and start cruising with tomorrow. She has a long list of factory options a few of which include; Onan 11.5 KW diesel generator with sound shield, foredeck sun pad, windlass, deluxe electronics package, bridge stereo and refrigerator, central vac, vacu flush heads with overboard discharge and so much more. To take a look at the complete list of factory options please click on the View Full Specs tab. 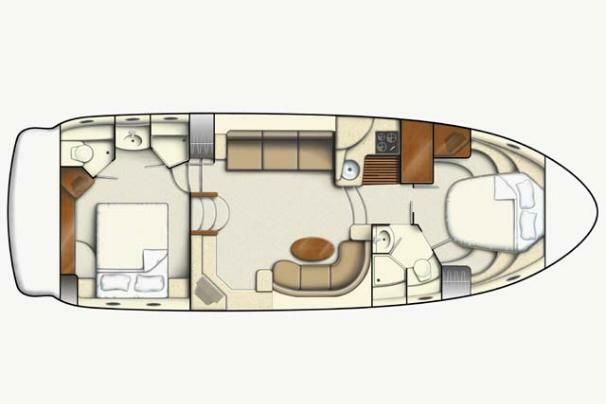 The 408 features a spacious master stateroom aft with walk around island style bed, including inner spring mattress. The VIP guest stateroom is forward with private access to the day head. This stateroom also includes an inner spring mattress. There is even a fold out flex-steel hide-a-bed with comfortable sleeping for six adults!! 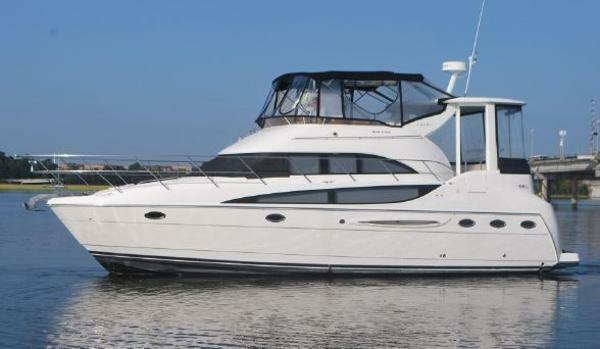 The complete galley helps insure this is an excellent weekend cruising boat that doubles nicely as a possible live aboard. The aft deck is spacious and provides a perfect relaxing and entertaining area. 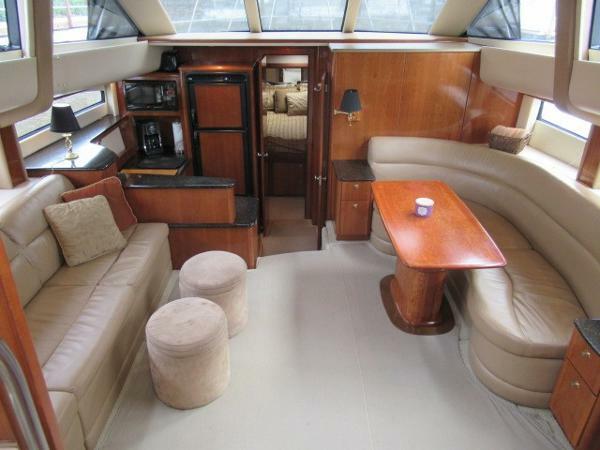 The bridge is spacious for cruising and entertaining which also features optional bridge stereo and refrigerator. This boat literally has it all! Fresh bottom paint and October and new batteries were installed in November of '18. Select smaller boat trades considered at a wholesale value. Please contact brokers with information on your current boat to see if it will be considered as a trade and trade value. Please contact brokers with questions or to schedule an appointment to take a look at her today. You will be happy you did! Thank you for considering this Meridian.